I actually got to sit down today and work on a page...and actually get it finished all in the same day! I incorporated 3 challenges into this layout (which I haven't done in a while). 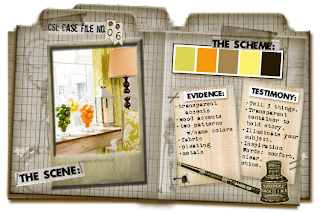 I used the sketch for the My Mind's Eye Blog Challenge 32 and also Case File #6, at CSI. The last challenge I used for this one, is the Jan./Feb. Issue Challenge #8 at Club CK, which was actually posted today. The challenge was to use one of the techniques from the 25 Ways to Use Stickers on Your Layouts article. I chose technique #3, which was to ink the edges of your sticker and create a dome effect using dimensional glaze. I used diamond glaze over the MME banner/date stickers. 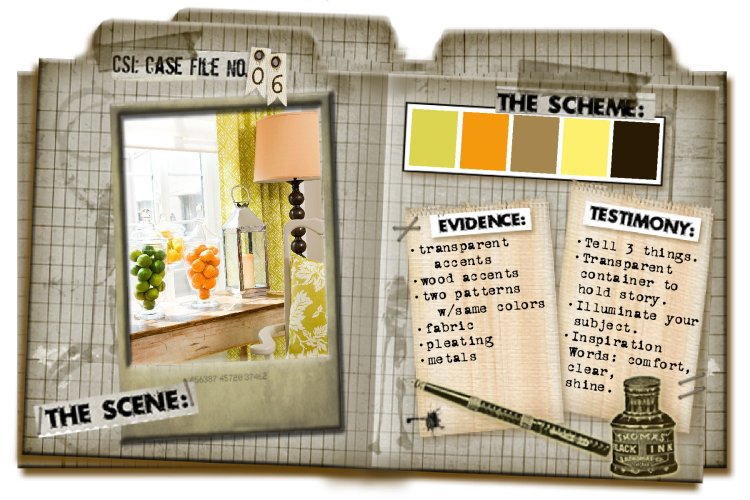 For the Evidence portion of the CSI challenge, I chose to use 2 patterns with the same color and wood accents. My journaling was written from the aspect of the inspiration word, "comfort". For the MME sketch, I rotated it to fit the portrait aspect of my photos. I hope you find a little bit of inspiration from my page or maybe from one or more of the challenges mentioned here. 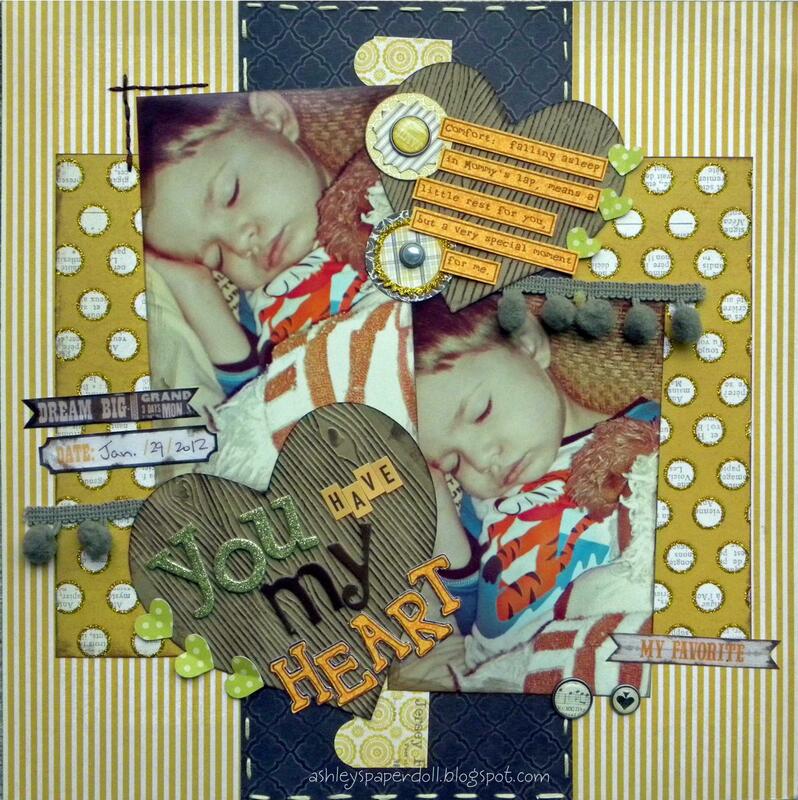 Make sure you stop back by on Friday to see my layout for the upcoming Fabulous Friday challenge at Frosted Designs. What a sweet page! I love the colors you chose for this layout, and the title is precious. Wow!! You are amazing at working all of those challenges into one LO!!! This is a great take on the sketch. Terrific technique with the stickers. 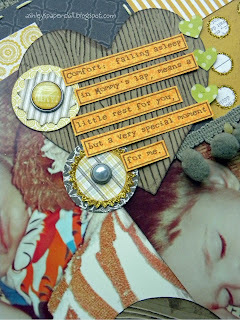 I love your title work and the hearts and your circular embellishments! Sweet photos! Ashley, this is terrific! First and foremost, those photos are the CUTEST :) He's so adorable! I love how you used multiple fonts for your title, and I also really love the tilted journaling strips inside the heart. Another beautiful layout! This is GORGEOUS! I love love love the photos, the colors and loving the HEARTS! Great use of that MME glittered paper. I stared at my paper for a long tim trying to figure out how to use it, but you took it out of "context" very well. very fun that you used so many challenges in one, love that sketch, may have to try it out :) You did a great job with it, love the colors and your sleepy little guy is just the cutest! This is amazing! I love the woodgrain heart and all the different fonts in your title!